At the Geneva Motor Show (March 7-17), Volkswagen plans to present its XL1 plug-in hybrid vehicle with some of the world’s most innovative automotive lightweighting solutions, including polycarbonate (PC) side windows with Exatec plasma coating technology from Sabic. This makes the Volkswagen XL1 the first vehicle to feature this advanced plasma coating technology on two-component (2K) injection molded PC windows. Use of Lexan PC window glazing with Sabic’s coating technologies reportedly reduces weight in those applications by 33% vs. conventional glass solutions, while delivering a high-quality optical appearance and scratch-resistant surface. Use of Sabic’s PC glazing solutions in the XL1’s side windows is said to demonstrate the feasibility of plasma coating technology for serial vehicles, while underscoring Volkswagen’s pioneering leadership in the use of lightweight, innovative materials to improve vehicle performance. The use of PC glazing proves to be practical for energy-efficient vehicles by enabling a substantial weight reduction, while meeting styling and functional requirements at a high level of quality. “The Lexan plasma-coated windows from Sabic are one of many distinguishing features on the XL1 that help us lighten the vehicle to reduce energy consumption,” says Ulrich Hackenberg, Member of the Board, Volkswagen Passenger Cars. The vehicle also features extensive usage of composite materials. In addition to providing the high-performance materials, Sabic delivered full application development assistance, technical leadership and program management from its Global Application Technology Center in Bergen Op Zoom (Netherlands) and its Advanced Glazing Technology Development Center in Wixom, MI. In the XL1’s fixed and roll-down side windows, Sabic features its injection molded Lexan resin with Exatec PC plasma coating system. The requirements for plastic glazing are met by depositing Sabic’s E900 plasma coating on the parts after molding. This glass-like plasma coating, applied over a hard coat, delivers enhanced weathering, durability, and abrasion performance and enables compliance with global requirements and regulations for plastic glazing applications. 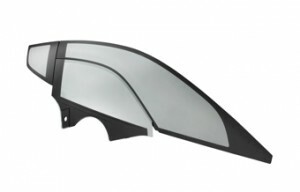 The XL1’s fixed and roll-down side windows are produced through two-shot injection compression molding using a color-matched Lexan GLX resin in combination with black Cycoloy XCM resin. The Lexan GLX grade, specially formulated for automotive glazing applications, provides optimal visibility and delivers high cleanliness, weatherability, easy processing and compatibility with protective coatings. The Cycoloy grade, a blend of PC and acrylonitrile-butadiene-styrene (ABS) resin, provides superior dimensional stability, excellent aesthetics and coating compatibility. Lexan PC glazing enables weight reductions up to 50% versus comparable glass materials, depending on the complexity and design of the window part. PC glazing technology continues to enable the development of advanced, lightweight window designs for the automotive industry. Just last October, Sabic announced with Ulvac—a leading, global supplier of mass production systems—the commercial availability of a machine for the efficient, high-volume production of lightweight, plasma-coated PC glazing components.